For some time now, I have been plagued with site issues..... When I log on to the site, or post a post, sometimes it just goes to a blank "this page cannot be displayed" type page.... a press on the refresh button usually fixes it. When I post a post, it then complains about the post being double, so it obviously submits my entry, but then displays a blank error page anyways. Also, sometimes when I go to the forum, the "log in" link on the top does not appear. Only after refreshing (sometimes twice), the link appears. I am suspecting that there are some issues with the web server setup (or maybe load balancers in front of it). I can't find any reason on my side, and all other sites work perfectly and without any errors. Has anyone else experienced similar problems? 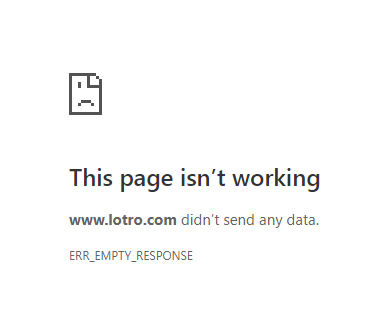 There is something going on with TLS handshaking, some ISPs seem to be fine, but others are getting constant time-outs when trying to do anything with the LOTRO website. My home line is with a premium ISP, but still has the odd issue, but my other connection is via a cheap n cheerful mobile data ISP, and TLS handshakes sometimes fail 10-15 times before I will even get into the site; with some days when I give up ever getting through. I've been having this for months, though much worse lately. My ISP is Xfinity/Comcast, so not an obscure provider. This session I had to refresh four times before I could get to the forums. My ISP is AT&T, I have Gigabit Fiber, and a steady ping of 3ms flat to 8.8.8.8 - I don't think my connection is the issue either. This is what I see a lot, and it only fixes itself after a refresh..... These kinds of issues have been plaguing the site on and off ever since they moved datacenters, I think they just haven't got the config just right on their web load balancers or something.... but that is just speculation. Not sure about other browsers, but with FireFox, I have a small notification window telling me what the browser is waiting for in the bottom, L/H corner. With LOTRO, 99% of the time it is waiting for TLS response. This started about 3-4 months ago after the world and its dog changed one of the underlying internet security protocols. I suspect LOTRO forum webadmin DIDNT; after all the forum software is 10 years out of date - just like the game. This happens to me often. I just figured it was because of using Opera and their built-in VPN. I hit refresh and the page loads normally, usually. If it happens when hitting "submit reply" to a message, after hitting back I'd probably not hit submit again. They got it, your page just did not load after the fact. It happened to me a time or two. Just the general weirdness of forums. I've seen worse. This one works mostly well, most of the time. At least for me. But about 25% of the time I must refresh the page just to get the log in/log out message at the top. Glad that works for you; doesnt for me, one of the first things I try. Exact same thing happens to me. The mobile version is quirky too. Sometimes I randomly get logged off.